Part-time Warwick resident Michael Kenny tows away pieces of the floating riverwalk while cleaning out the Brisbane River in a tug boat. NOT many people could be interviewed while shifting two 30-metre-long pieces of the Brisbane floating riverwalk but yesterday tug boat operator Michael Kenny handled the task with ease. The father of Warwick landscaper Clint Kenny splits his time between Warwick, work in Western Australia and his home on the Sunshine Coast and is now playing a vital role in the post-flood clean-up of the Brisbane River. Speaking from the helm of his tug boat yesterday, he described what had been an eventful four days. “We’re just trying to retrieve what we can from the river and see what’s around so it’s not a hazard for shipping. It’s going to be a long process by the look of it,” Mr Kenny said. “There’s a lot of debris in the water, including things like rainwater tanks, logs, dinghies, and lots of snakes. While Mr Kenny wasn’t the tug boat operator responsible for halting the colossal piece of riverwalk early last week before it hit the Gateway Bridge, he spent yesterday helping to salvage the remaining pieces. “Right now I’ve got some of the walkway attached, which has broken up into six pieces now,” he told the Daily News. 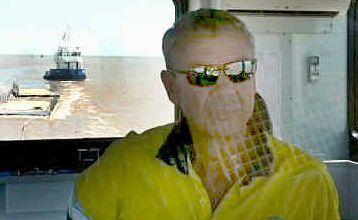 Having spent a lot of time on the water, most of which involves operating tug boats at a gas project in Western Australia, Mr Kenny said he became involved in the clean-up of the Brisbane River systems before returning to work. “The company I work for in Western Australia rang me – I was meant to be driving one of these boats back there – and asked me to stay because I was one of the closest ones to come and operate them,” he said. Mr Kenny was modest about his valiant work helping return Brisbane to working order. “It’s just part of the parcel, it’s what we do out west all the time,” he explained. “What we’re doing is no different to what we’re doing every other day.